In November of 2015, for the first time in its history, the Gettysburg Battlefield Preservation Association joined in a drive to erect a historical marker outside of the 1863 Gettysburg campaign area. The Board of Directors voted to assist an effort in Binghamton, New York, to erect a historical marker to recognize the 137th New York Volunteer Infantry. The unit was recruited in Binghamton and the surrounding region. At Gettysburg it made a heroic stand on Culp’s Hill, repelling Confederate attacks seeking to overwhelm the Union right flank. The Confederate troops formed up on the Daniel Lady Farm on Hanover Street, now owned by the GBPA. The 1,000 men of the 137th, recruited from the counties of Broome, Tioga and Thompkins, were mustered into service in September, 1862, at Camp Susquehanna on Conklin Avenue opposite downtown Binghamton on the south bank of the Susquehanna River. After it was reduced to a little more than 500 men following its action in the Union defeat at Chancellorsville, at Gettysburg, the 137th was assigned to take over part a line of entrenchments on Culp’s Hill. On the second day of the battle, the works were repeatedly assaulted by Johnson's Division of the old "Stonewall" Jackson Brigade, headquartered in the Daniel Lady farmhouse. By the end of the battle, 40 men of the 137th were dead, 87 wounded and 10 were missing, but Culp’s Hill remained in Union hands. The unit later would see action in Southern states included the battles of Lookout Mountain, Tennessee, and Kennesaw Mountain, Georgia, and took part in General William T. Sherman’s “March to the Sea.” Col. Ireland died from dysentery in Atlanta in September, 1864. 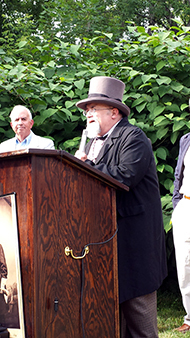 Attracting $2,000 for the historic marker campaign was spearheaded by 137th New York reenactors, state Assemblywoman Donna Lupardo, author and Historian David Cleutz and Tom Haines, owner of Atomic Tom’s, a music and art gallery in Binghamton. The historic marker was dedicated on June 23, 2016 in Veterans Park on Conklin Avenue in Binghamton. GBPA Board of Directors member Jay Purdy spoke at the event. 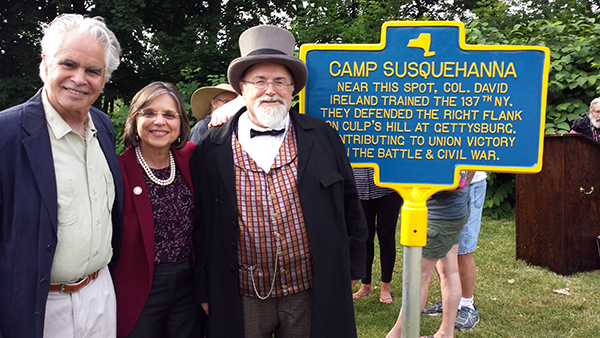 Author and Historian David Cleutz, New York State Assemblywoman Donna Lupardo and Jay Purdy of the GBPA Board of Directors next to the newly-dedicated marker honoring the 137th New York Volunteer Infantry. The following May, a portion of New York State Route 434 near the historic marker was officially dedicated as the Col. David Ireland Memorial Highway in honor of the Commander of the 137th New York. Ireland is buried in Spring Forest Cemetery in Binghamton.